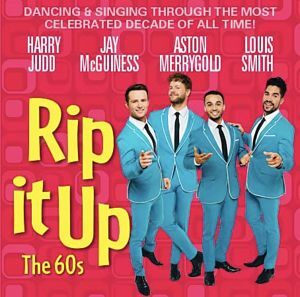 The song and dance show Rip It Up starring McFly's Harry Judd, Aston Merrygold from JLS and Louis Smith has just finished a successful UK tour and is now transferring into the Garrick Theatre from 7th February for four months until 2nd June, starring the original cast members plus The Wanted's Jay McGuinness. Smith formally announced his retirement from competitive gymnastics today saying: Gym has given me everything – it gave me the tools necessary to channel my ADHD throughout my childhood, and as I grew up through the sport, I very quickly found a purpose in life, and it has made me the person I am today. From a young age it became my dream to compete at an Olympic Games and represent Great Britain, so to have had the opportunity to do that on three separate occasions, and bring home four Olympic medals in the process, is something I will forever cherish and for which I am eternally grateful. This is the ultimate Strictly boy band of dance who bring the '60s into the 21st century, with song, dance, acrobatics and amazing visuals! Aston and Jay McGuiness sing, while Harry is on drums and Olympic champion Louis Smith performs amazing gymnastic feats. But what shines through the most in this spectacular show is the fab four’s phenomenal dancing talent. Dance the night away with music from the legends who dominated a generation including The Beatles, The Rolling Stones, The Doors, Elvis Presley, The Beach Boys, The Who, The Byrds, The Mamas & The Papas, Bob Dylan, Dusty Springfield, Burt Bacharach, Aretha Franklin, James Brown Marvin Gaye, Stevie Wonder and The Supremes. Guide dogs are not allowed inside the auditorium. Staff are happy to dog-sit and can look after a maximum of 3 guide dogs per performance. An usher will take you through the gates to the left of the building to an alternative entrance which leads to the Dress Circle. 1 step down to 2 spaces for wheelchair users at E13-15. No steps to the women’s to the right of the foyer bar, through 2 doors This is usable by someone able to leave their wheelchair with assistance. No steps up to women’s at rear of Stalls, 18 steps down to the men’s.